Our nervous systems crave predictability and consistent responses from our environments. This is often why we look to bad habits, certain unhealthy foods, alcohol or sometimes even drugs to give our nervous system the relief that it seeks from dealing with the stress of change. When we feel a level of stress that seems unmanageable, we will sometimes use substances to literally change our body’s chemistry, and give us the feelings of either “just enough” (speed up) or “not too much” (slow down) that we are so desperately seeking. Here is the problem. The effect of the substance or habit always wears off with time. More importantly, as we become used to the stimulus we rely upon (habituation); our body often needs more and more of whatever “it” is to get the same feeling. If we manage stress by working too much, we will probably need to work more and more to feel okay. If our life feels out of control, and we eat the wrong things to get that feeling of control back, we will most likely need to eat more and more to get the same feeling again and again. But there is always one continuous obstacle to trying to get the same feeling day in and day out on a predictable basis: LIFE! Life is a never ending source of different, and sometimes challenging, experiences. Life is always moving forward whether we want it to or not; and it isn’t taking any prisoners! So we have to move forward with our lives, whether we want to or not. No matter how frightening or challenging it may feel, life is always going to give us a steady diet of change, both good and bad. Both types of change will feel uncomfortable at times, and we’ll try to hang onto what we want (the things we define as good) and avoid the things we don’t (the things we define as bad). The truth is, however, that both good and bad will spend time in our living room, either invited or uninvited. 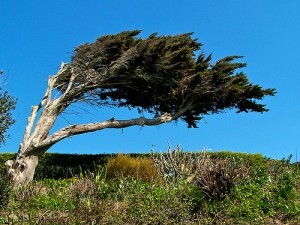 When the harsh winds of life buffet us, the best strategy is often to “lean into them.” Here are 4 principles that will help you hold your ground in the face of life’s challenging winds. (1) It’s supposed to be challenging. Sometimes it’s not adversity’s winds, it’s the way that we look at life that knocks us off of our pins. Our nervous systems crave reward and fear punishment. If we view adversity as punishment, however, we’ll fear it and resist it rather than learn from it. The simple fact is that “the rain falls on the just and unjust alike” as the New Testament put it. Bad things happen to good people and sometimes, paradoxically, really good things come the way of very bad people. What if that’s just the way of things? Once we stop trying to control the outside world, we can focus on the one area we do have some ability to control; the meaning we give things that appear in our lives. If our belief system is that life is challenging because it’s supposed to be that way, then good times aren’t a reward and bad times aren’t payback. What if the truth is there is no punishment, there are no enemies, there are only teachers giving us different opportunities to see, to change, and to grow? Approaching adversity in this way is not about giving in or giving up; it’s simply about focusing on what you can influence (yourself and the actions you take) and accepting what you can’t (things or other people that are outside of your control). (2) Work from the inside out, not from the outside in. The only thing that will always be the same about “your” challenging times is “”you.” You’re in them, and you will choose how or if you deal with them. The unfortunate reality is, if you don’t deal with your problems on your timeline, they will deal with you on theirs’. Given this reality, isn’t it best to focus on yourself and what you can and need to do, and not what is outside of you? The quality of the questions we ask ourselves dictates the quality of the answers we will find. If our questions are based on a belief that the power over our lives is all “out there,” change is unlikely, if not impossible. (3) Let pain be an ally. We are wired to avoid pain and pursue pleasure. It’s a great system, with one critical flaw. In short, our brains can create very effective strategies to get us to ignore the information that we need to receive from our feelings. Simply put, if something is hurting you, it’s supposed to and you need to do something about it! Adversity that results in pain can be a key signal that we need to adjust how we think about and see things in our life; whom we should let or keep in our lives, and how we should make decisions about what to do next. (4) Retreat is going to a better place to fight. I learned as a soldier that bringing an ego to a fight is usually a bad idea. When adversity presents itself, there is a time to lean into its winds and let them flow around you. If adversity’s winds are at tornado strength, however, trying to hold your ground to “prove something” is an ill advised strategy. Don’t let your ego dictate your actions. As I have been taught in the martial arts, there is nothing cowardly about retreating, it’s just going to a better place to fight. In challenging times, conserve your mental and emotional energy. Monitor your limits. Don’t be afraid to acknowledge when things feel like too much and you need help. We often need to step back from our problems to see them clearly. Rest when you need to. If it feels like too much, get an ally. Someone you trust who is not entangled in the same challenge can provide needed perspective, on both you and your problem. Distance from a problem gives us room, and the more space you have the more options you have, and the more strategies you can employ. Above all, remember that it’s the fact that you respond to a challenge that is important. Each time we respond, we learn about ourselves, what works well for us, and what doesn’t. All of this knowledge is incredibly valuable, both for handling the present crisis and for dealing with the next one that will inevitably come in the future. The Japanese samurai drew a sharp distinction between plans and preparation. Plans were valuable, but it was a bad idea to get too attached to them because life was so unpredictable. Preparation, on the other hand, was always important even if the future you planned for never came. Good luck on your journeys through challenging times.